This Alternative Provision (AP) school comprises a 22 place Behavioural, Emotional & Social Difficulties (BESD) secondary school and a 30 place Pupil Referral Unit (PRU). 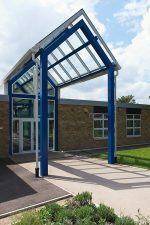 It was created by remodelling and extending an existing primary school. 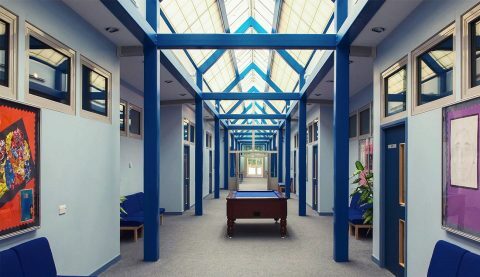 The design includes all the accommodation necessary for a full secondary curriculum except that the scale and arrangement of the provision had to be appropriate for the particular needs of the pupils. 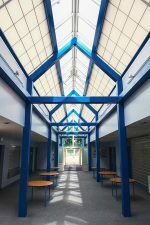 The specialist accommodation includes CDT, ICT, Food Technology, Science and a Sports Hall and is all clearly accessed from a wide ‘street’ which bisects the original primary school. A key aspect of the design was the specification of materials which provide high levels of naturally diffuse light, whilst minimising heat gains/losses as well as glare, to create calm and uplifting spaces in which to learn and work. The project was successfully completed within a very short programme through the use of a management contract. From beginning to end AD Architects were extremely supportive and professional and they were always available to answer any of my questions. 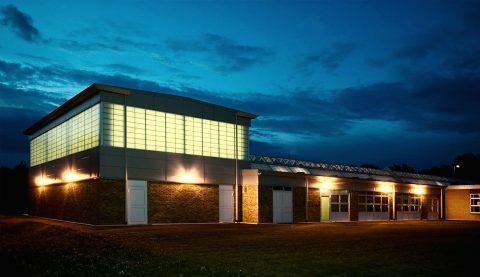 The attention to detail was second to none, AD Architects listened to our ideas and wherever possible incorporated them into the planning and subsequent building.